The coastal line of the country is 378 km long and is in fact the eastern border of Bulgaria. Compared to the Mediterranean, the waters of the Black Sea have much lesser content of salt and the beaches are covered with the finest sand. Despite its name, the color of the waters of the Black Sea is blue, varying from navy blue to turquoise. Presumably the name “Black” was given because of all the countless sailors that fell victim to the sea storms. Black Sea is very popular among holiday makers. Here we offer a list of the most visited sea resorts (north to south), but the ones mentioned in the list are far from being the only places that attract tourists. In reality the whole coastal line has become one big resort, where in some cases, the frontier between the different villages and towns is barely visible. Big five-star hotels, holiday complexes, family hotels, guest houses, rental rooms in many family homes – there is something for every person, every budget and every specific taste. Albena holiday resort in the north part of the coastal line, on 12 km south from the town of Balchik and 30 km north from Varna. Overseas tourists in Albena use the services of the Varna airport. 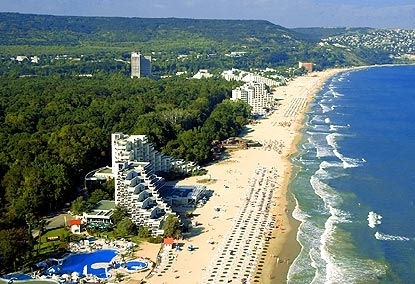 Albena is famous with its 5 km long and 150 m wide beach covered with the finest sand. There are more than 50 hotels and hundreds of coffee shops and restaurants. The modern infrastructure, balneological centers, the possibility for many sports activities attract thousands of tourists here every year. Golden Sands is the most popular resort on the northern coast line build next to one of the most beautiful national parks with the same name. At a distance of 17 km north from Varna, the complex is visited by many Bulgarians, but it attracts many visitors from Europe and Russia too, tempted by the pleasant climate, beautiful scenery and of course the 3,5 km long sandy beach. The resort gives possibility to each of its multiple guests to practice different sports – water ski, windsurfing, deep sea fishing, jet-ski, tennis and many more. Golden sands is composed of many hotels, restaurants, bars and night clubs. With the nightfall the bustle is at its peak, the lights of the nightclubs and casinos blend together and create the impression of an endless festivity, where young people will find all possible amusements day and night. Riviera is a big luxury holiday resort, which comes like immediate continuation of Golden sands. It is build up in a grovy park on area of 14 ha with private access to the sea. The complex is very well organized and equipped: composed of five hotels with different star rating in perfectly maintained environment where strolling people breathe tranquility. Until the 80s of 20th century Riviera club is summer residence of the totalitarian elite of the country and accepts official guests of Bulgarian government such as Willy Brandt and the Indian Prime minister Rajiv Gandhi. Today Riviera is accessible to everyone but it is highly appreciated by businesspeople, because some of the hotels here offer conference halls, talasotherapy centers and many more. The two hotels Riviera Beach and Imperial are considered the best international hotels on the Bulgarian coast. Sts Constantine and Elena – 10 km north from Varna and 7 km south from Golden sands stands the oldest sea resort on our coast, named after near-by monastery. Perched on a small rock just above the sea it offers a stunning view to the visitor. Hotels in the complex are divided by numerous gardens and parks, where guests can take a walk and take advantage of the fresh air coming directly from the sea. Along the banks of a small river that crosses the resort, few benches allow the visitor to stop for a while and enjoy the beautiful scenery. The 3,5 km long sandy beach is less than 5 min walk, and is accessible through multiple pathways dug in the coastal rocks. All this contributes for the calm and serene atmosphere in the complex. Water sports are feebly developed, but there are few balneological centers that make good use of the mineral springs in the resort. Sunny Beach is a big seaside resort on the south part of the coast, 35 km north from Burgas and 1 km Nesebar. All visitors in that part of the coast are using Bourgas airport. That is the biggest resort on the Bulgarian coast, next to a magnificent sandy beach with total length of 6 km. Big hotels, holiday villages, coffee shops, restaurants, bars, night clubs and casinos are small part of that resort, which during the active season overflows with tourists from Russia, North and Central Europe. St Vlas is a small town and resort close to Sunny Beach. It stands at 10 km north from Nesebar and 40 km north from Burgas. That resort is famous for its modern yacht club with capacity of accommodating 300 yachts. Elenite – small holiday village located in beautiful bay with fine sand at 40 km north from Burgas and 4 km north from Nesebar. Foreign tourists are using the services of Burgas airport. Elenite is the ideal place for a family holiday. All hotels and villas here were build-up among natural greenery, just next to the sea. Dyuni (The Dunes) is a holiday village located in a beautiful bay, 40 km south from Burgas and 6 km south from Sozopol. Foreign tourists are using the services of Burgas airport. Dunes offer 2 km of beach line with possibility for practice of most water sports. Here you can enjoy the calmness and tranquility you have dreamed of. Besides the above mentioned resorts and holiday villages, Black sea coast is home of many other villages and towns, all with first-class beaches, well organized and with modern infrastructure, that offer ideal conditions for one unforgettable holiday experience i.e. 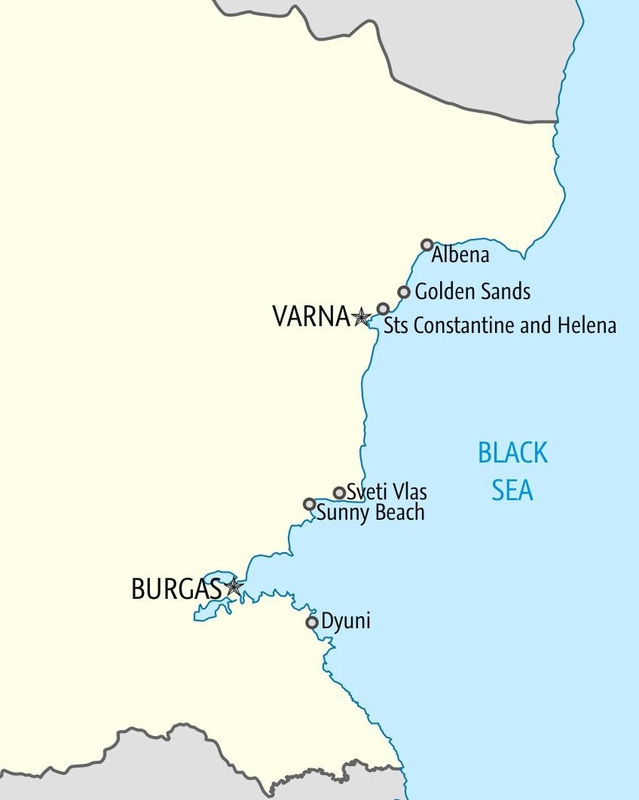 (north to south): Kavarna, Balchick, Kranevo, Byala, Obzor, Nesebar, Ravda, Pomorie, Sozopol, Primorsko, Kiten, Lozenets, Tsarevo, Varvara, Chernomorets, Rezovo. Bulgarian coastline is home of many historical villages and natural landmarks, all very interesting for everyone, who wants to use his holiday to become familiar with the history, culture and traditions of the country. A tourist can visit Varna, Burgas, Nesebar (included in UNESCO list of world heritage), Sozopol, Aladzha monastery, Euxinograd palace or the Botanical gardens in Balchick, cape Shabla and Kaliakra or make boat tour on the waters of Ropotamo river. Another interesting place is the town of Shumen, 89 km west from Varna with the Madara horseman, Pliska and Veliki Preslav in its surroundings. The town of Dobrich located 30 km from Albena resort and 45 km from Balchick and Sliven located 100 km from Burgas.